India legend Kapil Dev says Sourav Ganguly should continue as captain despite his dismal run of form in the Test series against Pakistan. 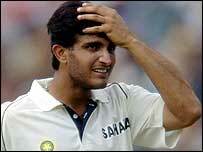 Ganguly made 48 runs in five innings and came in for criticism after his side lost the final game in Bangalore. But former skipper Kapil told BBC Sport: "I don't think there's anything wrong with his captaincy. "The last 10 years India's management have been more sensible. I hope they don't make an irrational decision." Ganguly has failed to make a Test century in 16 months and another former skipper, Bishan Bedi, says he should be dropped and a new captain appointed. Kapil says that could do more harm than good to the team. "Bishan played good enough cricket so he can give his opinion. I may not 100% agree that if you lose a Test you sack everybody and if you win you make a prime minister of somebody," he explained. "You have to rationalise what is best for the team. "I am disappointed about Ganguly's performances but he built the team and put it right on top. "Rahul Dravid is the only one who can [take over as skipper] but he's doing so well with the bat we can only disturb him." Ganguly was booed after his first-innings dismissal in Bangalore and at the post-match presentation, but Kapil played down the significance of that. "That happens in the subcontinent - it happened to Sunil Gavaskar, to me and Bishan Bedi. "It happens to every cricketer and we have to understand we are very emotional people but it's not end of the world. "People will become all right in a couple of days and make a decision for the country."